The great equalizer between the huge variety of handguns you can choose from is the holster in which you store your pistol. Once you’ve purchased that sleek new pistol, buying the right concealed carry holster is the next big step. Regardless of your new pistols design, lightweight frame, or stacking type, the inability to quickly and effectively draw your weapon will nullify all those features. Furthermore, that same holster needs to have the ability to rest on your body with the trigger covered at all times in order to prevent any accidental discharge. From law enforcement to the military that may need to carry their firearm all day or an ordinary citizen that is security conscience, these high-quality holsters will be comfortable for extended use. A good holster will also work to protect your firearm from the elements as well as your own body oils. Owning an inside the waistband or IWB holster can drastically reduce the silhouette of your pistol and prevent your firearm from falling out or sliding loose from your holster. The most important aspect of almost every holster is that your firearm is capable of sliding out of the holster when you need to use it without catching onto the holster as this is the leading cause of accidental firearm discharge. This first selection should come as no surprise and is featured at the top of this best ten list, The Alien Gear ShapeShift.This concealed carry friendly holster utilizes a modular design and supports a variety of compact single or double stack pistols. This product is available in both left and right-handed use and can be worn IWB as well as a few other ways. It is manufactured using a shift shell which is an injection molded polymer that is extremely durable. 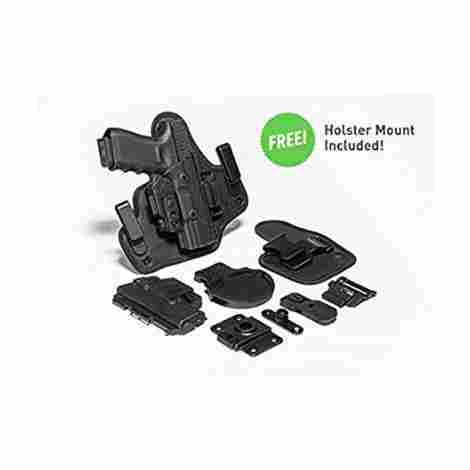 This holster has adjustable retention bolts that allow you to choose your desired retention with the use of an Allen key that is included in the purchase. No matter the reason everyone has a different preference when it comes down to the retention of your firearm in your holster. Some people prefer their retention to be really tight while others prefer a more relaxed and free feeling for an easy slide. With the Alien Gear ShapeShift holster, you can easily adjust the two bolts that adjust the retention using a small Allen key and three interchangeable risers. With firearms design and sizing varying so drastically from one manufacturer to another, finding the right holster for one, much less two or more firearms can be quite challenging. While most concealed carry holsters are made for specific models alien gear uses three different polymer shells that allow you to hold a large variety of firearms in the single holster. These durable interchangeable holster pieces are very easy to use and pretty much snap and hold in place. This holster made by alien gear is a bit more expensive than your standard concealed carry holster. While the price is a bit higher you do get four different holster styles so you can store multiple different weapon systems with this single holster. Additionally, the retention adjustability, as well as the ability to choose the different riser attachments, make this a holster that is very cost effective considering the higher price. The modular design ensures that nearly anyone can use this holster regardless of weapon frame or stacking type. The Shapeshifter is an extremely easy to use holster that includes an instruction manual and can be easily included in your daily wear. This larger holster is easily concealable and won’t draw much attention. This holster mounts to your belt providing stability and it helps to distribute the weight of your weapon as it rests on your hip. While IWB is the best option for concealed carry the alien gear starter kit is also capable of supporting AIWB, OWB belt slide, and OWB paddle mounting. This holster uses a thumb release which is a little bit frustrating. The shapeshifter has twist lock for a slide adapter that can be difficult to twist. The XL concealed carry belly band is an extremely comfortable elastic band that uses velcro to quickly and easily fasten and can be worn under any choice of clothing. The simple wrap-around design allows you to wear this band around your waist, further up on your abdomen or just about anywhere that's comfortable for you. The most redeeming aspect of this band is its ability to hold any pistol because it uses a simple holster design that is large enough to accommodate them all. The concealed carry belly band was designed very well and with its wraparound elastic strap is capable of fitting just about anyone. The band allows it to conform to your specific body shape holding your band and weapon firmly in place while using it. This same strap design allows you to position your firearm anywhere that is comfortable for you, hip, side or back you will have it within reach. Having a spare clip is equally as important as your choice to carry a firearm in the first place. While other holsters on this list do feature a spare clip pocket, the belly band has not one, but two additional pockets to carry a spare clip or even a tactical knife. From the conforming design to the holster that encompasses most pistol designs the belly band is modestly priced. 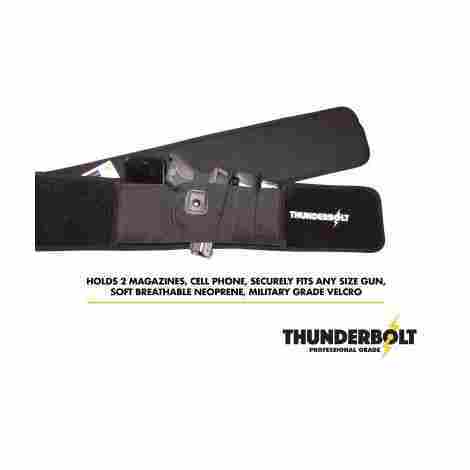 With a pistol and the two clips, you will still have room to hold a cell phone, important documents, or even a wallet nestled safely inside this band. 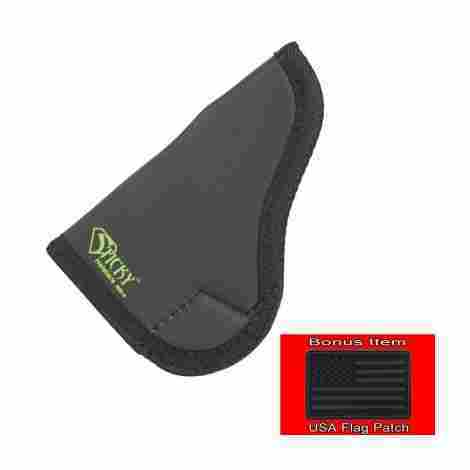 The velcro is made with highly durable and military grade material which ensures long-term use. The belly band has a very large carrying capacity, not only will it accommodate your firearm but additional important belongings. 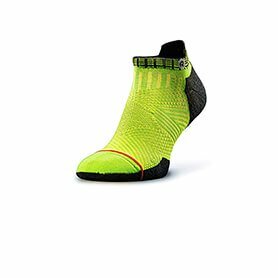 The use of neoprene and mesh materials in its production cause it to be very breathable and will remain comfortable on the warmest days. Positioning the belt around your back will offer added back support increasing this bands functionality. Being able to position the band allows for it to support left handed and right handed shooters alike. The elastic material is virtually silent allowing for you to quickly and quietly remove your weapon from the holster. The neoprene and mesh materials do not wick moisture very well and this condensation can result in your firearm having perspiration on it. While it isn’t enough to oxidize and cause rust it may need to be wiped on particularly warm days. Depending on the position it can be uncomfortable to sit with. As one of Houston's top-selling holsters of 2018, it’s a proud staple in this list as the most cost-effective option. 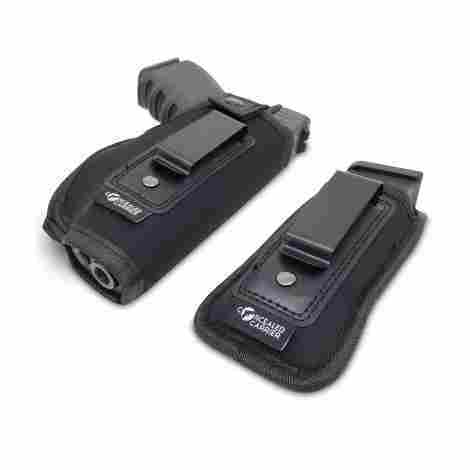 This holster offers great concealment is water proof, sweat proof and has a very low profile. 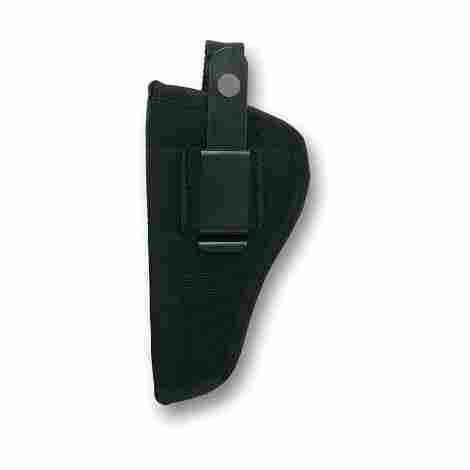 This holster uses a passive retention system that allows for a smooth and quick draw. The interior uses a suede lining that can withstand regular and repeated use with minimal wear. While generally used with Glocks, the simplistic design with an open end and passive retention system allow it to conform to most subcompact pistols. This same simple design complements the firearm by being lightweight and often times you will even forget you're wearing it. A holster for concealed carry must not be able to be seen with definite shape and size. That same simplistic design allows you to carry your firearm and it will remain virtually invisible to the naked eye. As the most cost-effective option on this list, this is one of the lower priced options for a concealed carry holster. The low cost speaks nothing of the quality however, it is very durable and will withstand regular use. The simplistic design is extremely easy to use simply attach it to your hip and you're ready to go. The Houston Eco is the most affordable holster on this list that is to withstand the test of time. The waterproof and sweatproof material add to the holsters general durability. The slim design of the holster keeps it compact on your body mitigating the shape and appearance of your firearm. This holster can feel a bit rigid and won't bend easily with your body. While it's a great holster it wouldn't be suited well for a larger single stack pistol. The Sticky Holster supports single stack subcompact firearms and allows for ambidextrous use. This holster is a unique concealed carry option as it can fit inside a pocket as well as being able to be used as an IWB carry. The sticky holster is modular in design allowing for it to be used with many different models of pistols. True to its name, the sticky holster uses a sticky outer layer to latch onto your clothing holding it firmly in place. Of the great features offered by the sticky holster, the ambidexterity is its most redeeming quality. It uses a “sticky” outer layer to grasp onto your clothing and keep it in place. 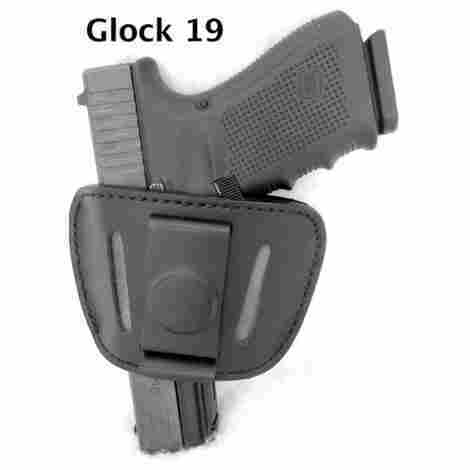 This allows you to place your holster on either side of your hip for both left and right-handed users. This is the only concealed carry option on this list that is able to be held securely in a pocket. While not a common area for a weapon to be concealed it does accomplish the job of remaining out of sight and not being recognizable through your clothing. This holster isn’t the cheapest on the list but brings a unique set features such as the pocket carry option and its sticky outer layer. This interesting option is very affordable and would make a great addition to your firearm. The sticky outer layer provides a unique way to allow ambidexterity as well as a belt alternative mount. The Sticky Holsters use of a modular design allows multiple carry options. The unique pocket design provides an unorthodox but welcome carry option. This holster only supports up to a 3.6” barrel limiting it to compact weapon systems. The sticky outer layer makes this holster more difficult to clean. This featherweight nylon holster by Bulldog is a great companion for a sidearm. It uses temperature resistant material that can withstand the heat generated from sustained firing. This material is very durable and will not crack or fade from the severe heat. Bulldogs nylon holster has an adjustability thumb break that can be used by both left and right-handed shooters. With many people being required to wear holsters for long periods of time and through strenuous physical activity you need one that will not be affected by moisture. This holster has a water-resistant outside shell that protects it from water or perspiration. Holsters have a tendency to wear over time. The bulldog holster lined spine to prevent any tearing or wear from repeated use. The bulldog holster comes in two different designs, semi-auto, and revolver. Your firearm of choice is sure to fit snug in this breathable and light holster. It is priced in more of a mid-range on this list and seems to fall there as far as rating as well making this a cost-effective choice. The additional padding help to provide comfort during long days while carrying your sidearm. The soft scratch resistant inner lining will prevent any blemishing of the finish on your firearm. The Ambidextrous belt loop and clip allow you to holster your weapon on either side of your body. Bulldog sells there holsters with multiple color options. The reinforced spine ensures long-lasting durability. There is no pouch or pocket for a spare magazine. The belt clips can feel loose on a smaller belt. The Don’t Tread On Me Denim Possum carry pouch is an above the undergarment concealed holster that has ample room for a large caliber pistol with any frame. The Possum carry pouch uses a water-resistant layer to keep moisture from your gun while providing the ultimate discretion. It has a spare pouch for an additional magazine or tactical knife and is offered as a one size fits most. The possum pouch doesn't hinder any important movement your body may need to make and it is very discrete. The Possum pouch is capable of holding some of the larger single stack .45 caliber pistols like 1911. This larger holster area accommodates many pistol designs and is nearly sure to suit your needs. Being capable of holding a spare clip is nearly a vital function. With the deep concealment, this pouch provides the additional clip is certainly a welcome addition to its features. This unique holster is a fine addition to this best of list. The possum carry pouch falls in the mid-ranged pricing on this list. The deep concealment and moisture wicking capabilities are some of the more valued features of this discrete holster. Made with high-quality denim and secured with elastic and nylon for a tight fit. Very soft and lightly padded for comfort. Weighing in at least that 4oz is the lightest holster on this best of list. The design of the pouches of this holster allows for left and right-handed use. While most other holsters on this list can be removed for a brief period to allow a break from the burden this holster wouldn't be easily removed. While it does cover the trigger, the area that covers it isn't very rigid. Another quality product from the Don’t Tread On Me line up is the Premium leather universal holster. This holster uses a high quality leather exterior that completely encompasses the trigger area providing ideal trigger protection. 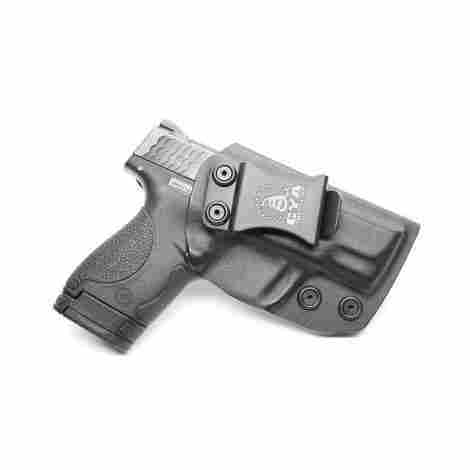 This ambidextrous holster has a removable clip for attaching to either the IWB or OWB. This full grain leather holster will fit most semi-auto medium and larger sized pistols without adding to the size or bulkiness of the weapon. When it comes to a holster size really does matter. This holster is extremely compact making it extremely versatile and allowing for you to conceal it inside your waistband, in a vest, or even around your ankle. The compact size compliments extended use and would be perfect for an everyday carry holster. The removable clip that is attached to this holster allows you to place it on either side of your body providing support to both left and right-handed shooters. This same positioning feature will allow you to choose what type of draw motion you use, whether you're shooting in a competition or just target practicing, you need quick access to your firearm. From the versatility to extreme compact size this is a very formidable holster on this best of list. It is on the cheaper end of this list and comparable to the most affordable holsters that are featured here. It offers most of the same features and has its own strengths that firmly place this as a solid choice for any buyer. Full grain leather that will ensure a long lasting functionality and stylish appearance to match most wear. A removable clip that provides both IWB and OWB holstering, as well as making cleaning more simple and providing ambidexterity. Completely surrounds the trigger mechanism preventing any accidental misfires. One of the most versatile holsters available for semi-auto pistols allowing nearly any weapon to be placed in it. Surprisingly satisfying retention capabilities for a smaller holster. The smaller design while nice for a discrete option isn't a viable option if doing anything requiring physical activity. Not as many features or pockets as other holsters on this list. This suede leather holster is basic and provides the most necessary of requirements, concealing your firearm inside your waistband. 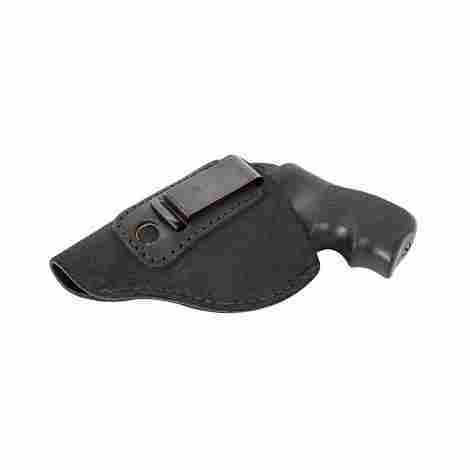 This lightweight and very slim holster is geared more towards snub nose .38’s and .38 specials of most brands. The basic design of this holster allows for quick and easy concealment and access when it’s needed. It offers both left and right handed support. This holster is handmade using high-quality suede that allows your firearm to slip in and out with ease. The quality is great and is built to last. The producers stand behind their product with a lifetime warranty. While making this list I included this holster to fill the J frame niche. The other holsters on this list while supporting the J frame weren’t specifically made for a J frame weapon system. This holster is a valued addition to the diversity of the frame support on this list. This holster while very basic in design still falls into the mid-range price area. While it is lacking in features and the simplistic nature of this holster makes it feel like a lower valued holster. Therefore this is a lower rated but noteworthy product on this best of list. Handmade here in America to provide the high quality we’re accustomed to. Backed by a lifetime warranty the manufacturers stand by their product proudly. The lower profile provides a comforting feel and lower burden while using this holster. The full J frame support brings a nice option for any snub nose .38 needs. This holster is discrete enough to be used as an ankle holster. This product has a higher price point from the production but offers limited features compared to others in the same range. The CYA supply company’s IWB S&W 9mm and .40 is a unique option for this list. The design is specifically geared to the Smith and Wesson brands of the 9mm and .40 pistols and conforms to their specific shape making them only functional for those brands. What makes this holster good is exactly that, it is made specifically for a weapon system. When your weapon is in place and it sits secure, you know without a doubt there is no obstruction or anything preventing your weapon from clicking into place with their retention system. One of the most gratifying feelings you can have is when something clicks into place and conforms to its right position. The retention system on this holster should be a standard that other manufacturers strive to surpass as it will make an audible clicking sound when your weapon is secured into position. You will instantly know when your weapon is ready for the road with this unique feature. While not everyone that uses a holster will need this feature it is quite noteworthy. 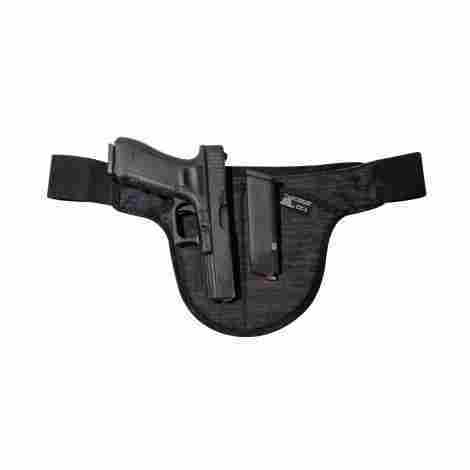 The sweat guard will run along the slide of your pistol keeping it clear of moisture or sweat should you be perspiring while using this holster or simply happen to get wet. This holster is one of the higher priced holsters and while the features are quite amazing, it is only suited to meet a specific group of weapon systems. Should the design have been modular this surely would have been a higher rated holster on this best of list. Adjustable draw angle, using an Allen key that is provided in the original purchase. The Posi-Click retention system that provides an audible locking click. Made using boltaron material for long-lasting durability. Adjustable retention pressure to allow for some personalization. This holster is only available as a right-hand draw limiting its functionality. 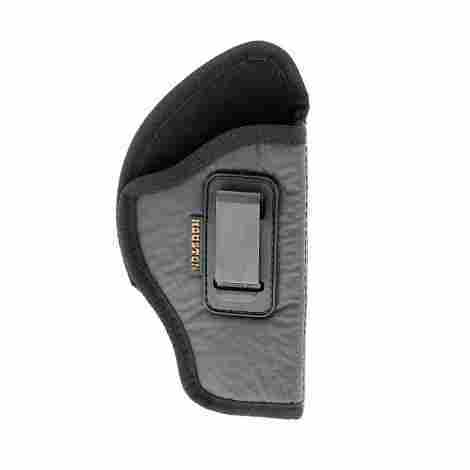 This holster is specific to a single firearm manufacturer. This concealed carrier universal holster uses a neoprene breathable material to provide a lasting comfort through extended use. Whether it’s your main weapons holster or a spare holster for your ankle weapon it is sure to give a quick drawing and durability functionality that rivals to most expensive holsters. This holster uses a thumb break retention strap that is incredibly easy to remove with a simple thumb motion. The modular design featured on this holster is its most prized quality. This concealed carry holster will support any frame and any sized gun from compact to a full size 1911. While not specifically unique on this list when combined with its extremely low cost it was a much needed beneficial feature. Having a spare clip is definitely important whenever you make the choice to concealed carry. Other holsters featured here do have spare clip compartments however this holster is the only one that has an entirely separate pouch with its own anchoring clip keeping the weight disturbed between a firearm and spare ammunition. While this holster doesn't have everything it does have a good selection of prized features that are staples for any holster. Combined with the additional clip pouch this holster is hands down the least expensive option on the list making this a very valued product. The biggest pro for this product is the extremely low cost compared to others on this list. The versatility of being able to holster any semi-automatic pistol is a great added benefit. This product has a lifetime warranty from the manufacturer drastically increasing the value. The quick release thumb lock adds security while minimizing frustration. While it's a great system you will struggle to tuck in a shirt when it's on your waistband. The belt clip can be a little flimsy on smaller belts. One of the first and arguably most important aspects I had to consider when writing this best of guide to concealed carry holsters was the performance of the holsters. A holsters ability to perform under any circumstance is nearly as important as the firearms ability to perform in any circumstance. Not only does it need to provide stable and unwavering control over the storage of you firearm on your body, but it needs to be able to operate in a manner that will safely allow you to remove your firearm when needed. Anything that gets caught on your firearm can cause you to pull up on the trigger. The next aspect of performance I wished to add here was the holster’s capability to support nearly any pistol regardless of the frame type, stacking or size. In order to do this, I made sure to select products that were general, and modular in design or offered a unique feature in order to allow their holsters to compliment any pistol. While some of the holsters on this list are specifically modular they were picked for unique options that offered something a generic holster wouldn’t. While it proved to be a difficult task I believe I was able to include holsters that would be able to hold nearly any pistol you can find on the market today that can be used for concealed carry purposes. Every user has their own preferences when it comes down to the positioning and angling of your firearm. While the functionality isn’t affected so much by your preference, the option is one of personal preference and with that in mind I included options that were capable of mounting at nearly any position on your belt and in some cases other places as well. As for the angling, most of the options on this list allow you to adjust your pistol to an angle that is comfortable to you. This adjustable angle will ensure you can pull your firearm with ease and comfort without sacrificing any time or movements that could cost you in the long run. Another trait of performance I selected to use as a filter for this list was the value the item provided compared to the cost. Things that affected this decision were the materials that were used in production, the features that each holster offers, and the overall cost to purchase the product originally. Furthermore, those that offered a manufacturers warranty and were capable of being easily replaced or repaired, were featured higher on this best of list. The holsters that failed to maintain good performance throughout the lifetime of the product were placed lower on the list. The final trait of performance that is nearly a necessity is the ability to provide left handed, right handed, or ambidextrous functionality. While right-handed users are more common often times the situation in which you’re using your firearm will dictate the hand with you hold your firearm. If you were to pie a corner from right to left direction holding the firearm in your left hand would all you to have your firearm at the apex of the corner the entire time, whereas if you pied that same corner in a left to right direction your right hand would then be the ideal stance to take. Having a holster that occasionally allows you to draw your firearm with ease wasn’t going to cut it for this list. Reliability of a firearm is a very important aspect you don’t want to overlook during purchasing, and the same can be said for a good concealed carry holster. If the holster only covers your weapon some of the time, it has no measurable or unreliable effectiveness. Should your holster occasionally release your firearm free to fall out at any given moment you are liable to cause serious or even fatal injury. A holster that will reliably retain your firearm and prevent any chance of it being removed when it isn’t wanted is a key trait that I sought to impose upon this list. With reliability in a holster being rather vague I determined the first area in which you will need some reliability is support during extended use. From military to law enforcement many people that need a reliable holster will often have to wear it for countless hours during the day. Should the mounting clip break after one use, your holster is about as useful as a brick to hold your pistol. Each of the holsters that I selected uses a mounting system that will hold your firearm securely to your body no matter how long you need to carry it. Another more basic trait of reliability when it pertains to holsters is their lifespan. No matter the product the last thing anyone wants is to order it and have it break within the first few days of use. A reliable holster will last anywhere from three to five years with the most reliable being capable of exceeding this time frame. In order to ensure your holster would be a lasting choice and essential addition to each and every firearm, I chose products that were made with highly resilient material and resistant to wear from everyday use. There is always the worry that your firearm may come loose and simply fall out of its holster. Not only would this be dangerous but it is also embarrassing for anyone that happens to be in that situation. By making the choice to concealed carry you are accepting responsibility for that weapon system and any fallout that can incur from having it. With this in mind, I included options on this list that have thumb lock systems or were able to adjust retention to a point that no firearm would simply fall out of your holster without some force acting upon it. While retention and keeping a firearm in the holster is an important safety consideration, that same aspect needs to be contingent on certain aspects. A holster is made to have your weapon withdrawn easily from its holster nestled safely on your side. Any design flaws or protrusions on your weapon can and will get caught in your holster when you draw your firearm. Each of these holsters listed in this best of guide has a smooth slide feature allowing for you to pull your sidearm with ease of motion and without getting caught in the holster. No matter the holster there are certain industry standards that make up what a good holster will entail. Almost universally accepted as good practice is a holster that will envelop the entire trigger mechanism on your sidearm. Covering the trigger mechanism will prevent any foreign object from latching onto your trigger and causing your weapon to fire. Every holster on this list does embrace this requirement and will cover the trigger regardless of positioning or mounting type. The most basic of all of the requirements on this list is that the holster is capable of concealing the firearm from the eyes of the public. Concealed carry laws vary widely from state to state, however in some states should the weapon be visible you could be subject to criminal prosecution for violating them. Whether it be an IWB mount or a mount that can hold your firearm on your ankle or chest, all of the holsters I selected are guaranteed to keep your weapon hidden in plain sight. The last thing you want when firing your sidearm is to have to empty out a box of ammunition and reload the same clip continuously. While I didn’t make this an absolute requirement for every holster on this list, another trait I considered was the holsters ability to accommodate a spare pouch for an ammunition clip or tactical knife. I considered any holster that offered this small but noticeable addition to having slightly more value and offering more conformance. The outfit with will come into play when using one of these concealed carry holsters. While most of these holsters mount onto a belt, not every outfit you wear from day to day will have a belt. Trying to overcome this inconvenience I selected a few products that either used a mounting that doesn’t require a belt or would wrap around your body instead. When comparing the items on the list I compared these holsters based on their cost, ease of use, availability, product user reviews, and many other traits. After assessing each item I placed the items that offered the most functionality while remaining affordable near the top of the list. While some of the items are more expensive than others on the list and rated lower, the additional value comes from the extra features and capabilities the product offered. Whether you actually use your firearm or not your holster is going to end up showing signs of wear with enough time. Day in and day out sliding your firearm in and out of the holster will put it to the test. Not only will a good holster accept the challenge, it will go one step further and ensure your firearm remains free of scoffing with a soft inner layer. The truly durable holsters will be capable of maintaining the same retention you experience on the first day of use. One of the most vital components of a good holster is the material used in its production. From durable polymer injection-molds to full grain leather, each of these holsters uses higher quality materials to bring an enduring product that won’t falter without serious use. With some of the holsters on this list using small moving parts and interchangeable pieces, being able to easily repair or replace the product or its parts was a key quality to keep in mind. Moreover, some holsters on this list were selected for their ability to be easily replaced due to low cost. Although not vital to the functionality of the holster, offering additional features will add to the value of your purchase. From a spare ammunition pouch to modular attachments the small seemingly inane features will bring out the full experience of the holster. Many of the chosen holsters offer a unique feature that is sure to enhance your holster. The holsters on this list are quite durable, however, odd things happen and your holster could become damaged or broken. In the event of this occurring a good manufacturers warranty will make all the difference. Nothing says good customer service and speaks to quality like a lifetime warranty. Most of the holsters in this line up have some type of warranty. Nearly as unique as everyone’s individual preferences is everyone’s body shape and size. The most well-designed holsters will be able to be worn by any user regardless of size. Most of the options on this list use IWB clips that simply attached to a belt and can be worn by anyone. Others use large wrap around bands or are for more concealment and utilize a crotch carry. No matter the choice these holsters are sure to fit most any who are interested. Q: Will any of these holsters support my firearm of choice? A: Everyone has a different every day carry choice. While I can’t say that every single sidearm will find a holster on this list, I’ve included modular, and universal holsters that will accommodate the most common pistols carried today. Q: Will these holsters comfortably fit someone of my size? A: Everyone has a unique size and in order to ensure that everyone can find a holster I’ve included multiple choices that can contain just about any users needs. Q: Do these holsters allow for a larger carrying option? A: While most of the holsters on this list are geared for the sub-compact styled pistols due to their ability to be easily concealed, there are choices that will allow you to conceal a larger 1911 pistol or similar .45. Q: How durable is the mounting system? A: The mounting system is a critical component of a good holster and without a sturdy clip or belt loop the holster is sure to fail. Each of these holsters uses a different method to mount but each is quite durable. The hardest part is selecting the one that is right for your needs. Q: Are the bottom of the holsters opened or closed? A: Each of these options has their own set of benefits and in order to provide a diverse selection I added both open and close-ended holsters. Q: Can I still use my laser/light attachment while using these holsters? A: The ability to mount additional parts onto your sidearm will vary between these holsters. Some of the holsters use a larger pocket for your firearm and would surely be able t squeeze in a laser sight or strobe light attachment. Q: Will these holsters allow me to adjust my retention? A: Your choice of retention is almost as important as your holster. Some of the holsters I’ve selected allow you to use an Allen wrench to manually adjust the retention to your very specific level, while others have an audible click to inform you your firearm is locked in place. Q: Do any of these holsters feature appendix carry? A: For concealment purposes most of these holsters use and IWB mount keeping the sidearm out of sight. However, a few of the options do support appendix carrying to allow for a more natural feel when unholstering your sidearm.